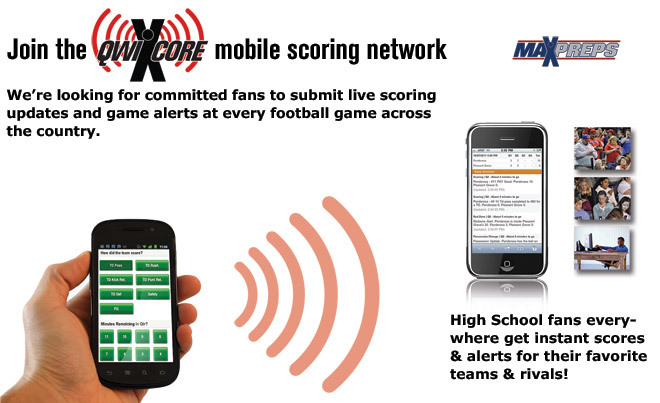 MaxPreps is developing a nationwide network of live reporting from sideline fans. Any fan with a love for their team and a smartphone can turn their team into a feature 'Game Of The Week' for MaxPreps. You only commit to one game at a time and let them know by signing in at your team's MaxPreps schedule page. For more details, see their simple guide at MaxPreps Quixcore. These reports are essential to building a better communication system throughout the national homeschool football network. In addition to the Quixcore reports, we urge each coach to assign a team parent the task of texting halftime and final scores to the state sports media network. The visibility in local media is a intricate part of the precious exposure which helps build the rosters for future seasons. In future posts we will discuss the viability of webcasting from the bleachers, using Ustream.tv. In recent ears, Massey Ratings has had their ups & downs. They were recently licensed to USA Today for high school football. The down side is that coaches have very little opportunity to assist in the full reporting of results, stats, rosters, and schedules. They seem to rely on the spotty results of their national team of news journalists. But since this is still for the most part "preseason", we will compare the Top 25 rankings and order for the two rival ranking services. NHFCS cannot yet employ Massey formulas because USA Today omits many prominent homeschool teams from their rankings. CBS Sports released their updated Homeschool Prep Football rankings for August 27th. Division 1 saw a little movement at the top spot. 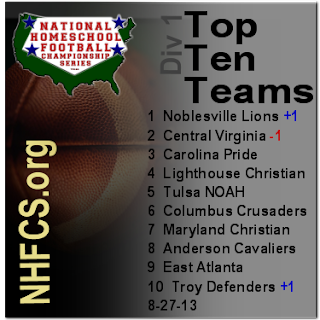 The Indianapolis Lions enjoy their very first claim as the top homeschool div. 1 team. Defending national champions, Richmond Disciples slid back to #2 for the week. Troy Defenders also entered the top group, coming up to #10, as Crown Athletics had a disappointing early season loss. This weekend will be the first head to head action for many of the teams across the nation. Much of the preseason formula is based on strength of schedule and returning players. Division 2 rankings will be delayed until further game results are reported. See the entire list at: http://www.nhfcs.org/rankings.html. The NHFCS will post updated rankings each Tuesday throughout the football season, ending with a national championship announcement on Dec. 1st. The start of the 2013 Season is just weeks away and the staff at the National Homeschool Football Championship Series (NHFCS) is just as excited as the teams for that first kickoff starting the 2013 Football season. As a reminder, beginning this fall, the NHFCS is introducing both a National Preseason Top 25 Ranking and a National Preseason All-American Team as well as Post-Season National & Regional Awards. This week, the NHFCS wants to remind our players & coaches that to be included in the Preseason Rankings, we need teams to upload & post their rosters and schedules to MaxPreps by no later than August 26, 2013 for consideration in the National Preseason Top 25 & Preseason All-American Team. The NHFCS is truly excited about the upcoming season and we hope you are too! For more information on the soon-to-be announced Preseason Ranking, our Ranking requirements, and Post-Season Championships & Awards, please feel free to contact the NHFCS through our website or Facebook.